I have, like, writer’s block. How do I get started with my MMD animation? I can’t make my MMD video, it’s too hard to get started. to get your MMD Animation Started! When you first load your model… “There she is…” frozen in that robot-like position. The mind’s-eye view you had envisioned just flew out the window when you saw that pose! If you have a saved pose, you can simply load THAT as a way to break the ice! It’s amazing how much more inviting the whole project becomes when you load that pose… it’s like you’ve taken a giant leap into it with only a few clicks! … and I find I use them all the time! 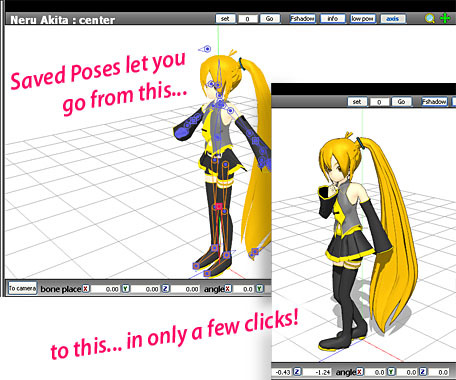 The Livelier pose is a nice basic position that you can use to start your animation or demo a new model. Download Reggie’s Little Pose Collection from the Downloads page. You will also want Reggie’s Hand Pose Collection… available from the Downloads page, as well. In it you will find MANY hand poses… for right hand and left hand… point relaxed… point blame… point pistol… relaxed open, relaxed closed… one… two… three… four… just to name a few! You will be ready to start your project and make real headway with just a few clicks of the mouse. Not just for Frame Zero! You can load a pose anytime and adjust it to fit your scene. Here, in my Rin Needs a Hug video, I used the Stand Dejected Pose to instantly get the mood I wanted. Watch out: often a pose has a Center Bone saved that takes your model to center-stage… it’s OK; just move her back to where she belongs. You can load the Livelier Pose in frame zero… and the Stand Dejected Pose in frame 30, press play and watch as the model smoothly slides from one position into another. Here is a series of hand poses that were pasted just a few frames apart from each other. MMD makes a smooth, flowing motion between the various poses. Search Deviant Art for poses! But how do i Create a pose and save it? To save a pose, enter 0-0 into Frame Manipulation Panel’s fields under the bone list (or type the exact frame number if you have moved the timer for some reason), select “All frame” from the selector to the left and hit “range-sel”. All “diamonds” in the selected frame will turn red. Then select “File->Save pose data” from the menu. 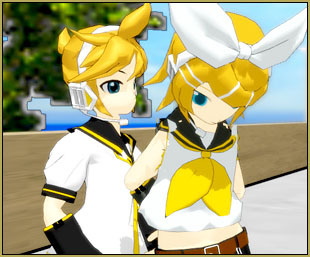 Can I downlod mmd in phone? Download it, you can. Use it, no. 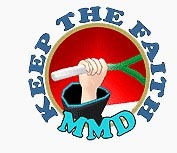 MMD is for Windows environment only. How do you download the app????? PLEASE TELL MEE!! Well, I wonder… Downloads page, maybe?